Left-leaning Independents and Democrats, if you stay home this November, a Republican Senate will basically be on you. Republicans can be ousted, but only if you show up and vote against them. You can be damn sure that our fellow Americans who think they’re Republicans will be showing up. Yes, vote against Republicans. All Republicans. The GOP has become a party of extremist ideology that no longer resembles the core values of America. These disturbing ideas are among Republican dogma and policies. They are NOT core American values. They are, in fact, the antithesis of what America is about, and it is why every Republican must be defeated. The GOP in its present incarnation simply does not offer anything of value in the short or long term to anyone outside the Top 2% of wealthy Americans. The only way for the GOP to get the message and to change is for those of us in the middle and the left to outnumber and outvote our right-wing fellow citizens on Election Day. What would cinch the deal would be to get some help from whomever is left in the GOP rank-and-file willing to accept the truth, and that is this: Your party does not care one whit about you and, in fact, they are dangerous to you and the rest of society. Right-wing ideology and policy are traceable as the primary sources of all of our geo-political and economic problems, past and present. Thanks to the tea party and right-wing Big Money nowadays, the GOP has moved too far away from any middle ground or compromise worth considering. This is where Republican leaders have failed their party and their constituents. For anyone to believe that somehow the current crop of tea party Republican leaders is going to start moving the party toward the rest of us is naive fantasy and a denial of reality. Unless and until the American voting populace rises up to defeat EVERY SINGLE REPUBLICAN EVERYWHERE, the GOP will not change. It’s more important than ever that we in the middle and on the left step forward and become this country’s leaders. Independent and internal change from within really isn’t in the nature of politicians and political parties. Current campaign finance laws more than ever ensure this by rewarding the self-serving and cowardly politician. Politicians do not lead, they follow. They follow the money that funds their campaigns and the follow whatever policy mandates that money issue to them. Unless you’re among the wealthy and powerful, you (and I) are not having the influence we should have. It’s not just the GOP. This truth applies to ALL political parties, but the first thing we must do is to stop agreeing with the notion that the Republicans and Democrats are the same. They are not. That is why we must vote and we must lead our fellow citizens and our elected representatives with courage, resolve, and conviction AWAY from ultra-conservative, right-wing ideals and ideologues, not toward them. The time for hope and compromise is over. Politicians demonstrate daily that they have no courage and no real convictions other than to those people and the money that they believe will help them to get elected and reelected. Let’s be clear on who we got to this. Thanks to CONSERVATIVE campaign finance laws and CONSERVATIVE laws meant to restrict voting coming from ACTIVIST CONSERVATIVES on the Supreme Court, our politicians and elected leaders are ever more constrained to serve their Big Money masters, not us. How is this manifesting itself this year? 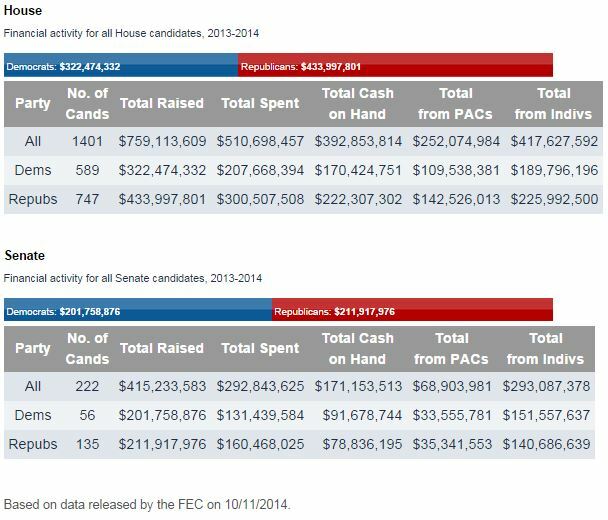 As evidenced by non-partisan sources like OpenSecrets.org, the GOP is leading so far when it comes to money for the 2014 midterms. While it’s pretty close right now, and while the Democrats are by no means pure on the issue of money and influence, it is immature, uninformed, and disingenuous to keep believing and to keep saying that both parties are the same and equally guilty. The GOP demonstrates constantly that they have no appetite to move out of line with where the tea party and conservative Big Money powers are leading them. Therein lies a fundamental difference that separates them from the Democrats. This is what makes Big Money that comes from the likes of the Koch brothers and Sheldon Adelson different from money that comes from Michael Bloomberg, George Soros andTom Steyer. The first two are trying to move the country in a direction that is harmful to everyone but them by backing Republicans. The others are not. Where the money comes from and what it will be used for tells us about the choices being made by politicians. This is why any politician who calls themselves a Republican must be punished at the polls. They have made a conscious decision to join the party funded for and rooted in ideals like inequality, bigotry, irrational xenophobia, science denial, and catastrophic economic theories. No matter how moderate or reasonable any one Republican candidate might seem, any candidate who calls themselves a Republican is a representative of that party and so must be defeated. It’s the only way to bring change to that party; to punish them for their ideology and their policies at the polls. To all you rational and reasonable Republicans, you need to start voting FOR your best interests and AGAINST your party, too. It’s your only hope of leading the GOP away from the precipice of political extinction to which it now races at full speed. One day soon, this country will be a minority-majority country. The GOP has almost no appeal to minorities. Your party also seems intent on alienating women, and it already has nearly zero appeal to anyone who isn’t an aging, white, rural, male Christian. You must know that that is a strategy that leads to extinction. So, this election is on you, too. Save your party and your future. It’s on all of us in the middle class to save America from the disastrous ideals and policies of GOP conservatism. If you don’t get to the polls on November 4 and if you don’t vote against every Republican, you simply cannot expect them to change, nor our society or our politics to improve. The Democrats in their current incarnation are no prize, either, but it is the Republican party which must be defeated now if we hope to pull them back to the middle where some compromises are possible. I’m done moving toward them. It’s far past the time that conservatives were called out for the damage they and their ideology have done and continue to do.